The new Monster 797 finally brings the iconic Monster spirit and Ducati values within everyone’s reach. Sporty, compact, essential but also sophisticated and contemporary, the Monster 797 provides a gateway to the Ducati world, for those looking for an easy, intuitive ride as well as sheer sports enjoyment. 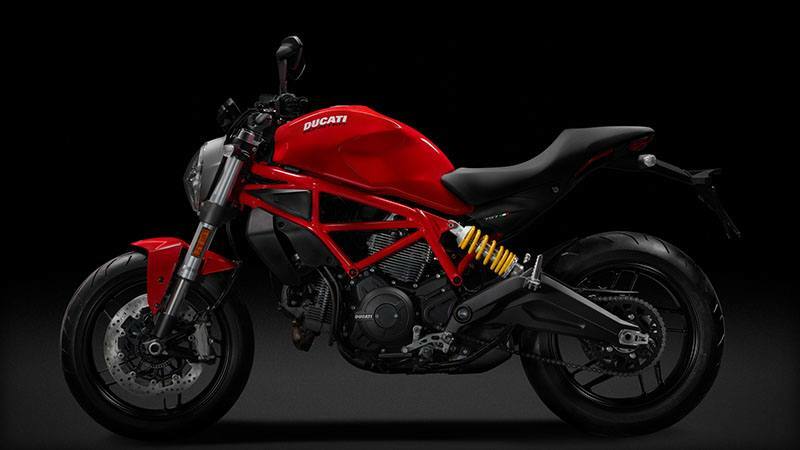 FRAME: The Monster 797 is equipped with the traditional Ducati steel trellis frame. 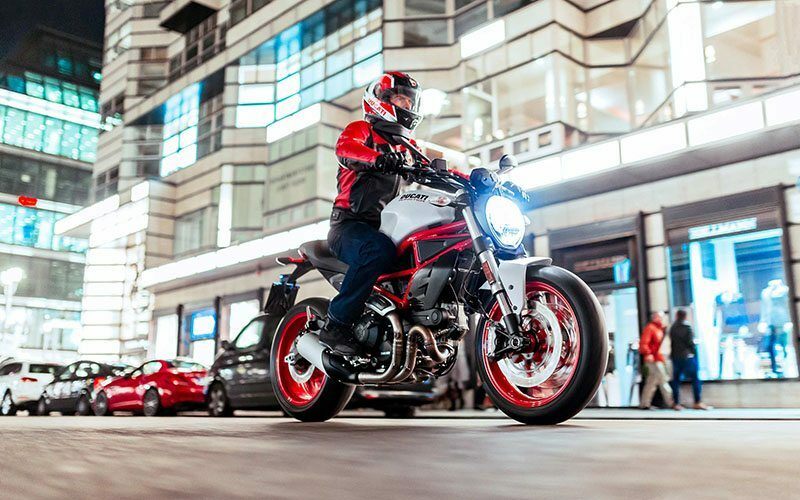 Essential, rigid but also lightweight, it leaves the Ducati twin on view and, together with the steel tank, is one of the characteristic elements of the Monster. The frame marries perfectly with the cast aluminium double-sided swingarm and, thanks to the compact 1435mm wheelbase, ensures agility in traffic and stability at high speed. 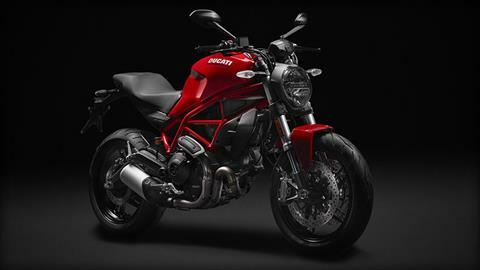 SUSPENSION: The Monster 797 is equipped with a 43 mm Kayaba fork with 125 mm travel. Rear suspension comprises a Sachs shock, with adjustable spring preload and rebound, positioned on the left side of the bike and connected without progressive linkage to the frame and swingarm. The rear shock system boasts maximum travel of 150 mm. 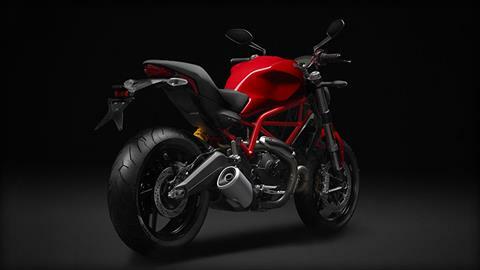 RIME AND TIRES: The ten-spoke rims of the Monster 797 are in lightweight alloy, with a 120/70 ZR17 at the front and 180/55 ZR17 at the rear. 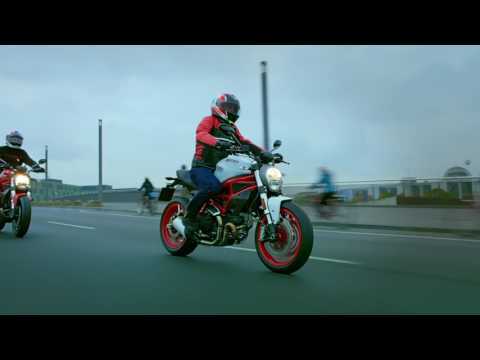 The Pirelli Diablo Rosso II tyres are produced in a double compound to ensure resistance over long-range trips and continuous grip even at extreme lean angles. These high-quality tyres apply Pirelli EPT (Enhanced Patch Technology) to maximise the area of contact at any lean angle and FGD (Functional Groove Design) to optimise their performance in wet conditions. BRAKES: The Monster 797 is equipped with a Brembo braking system. To ensure optimum performance and maximum safety during braking, two 4-piston M4-32 monoblock radial callipers at the front act on 320mm discs, with an axial brake pump and integrated oil tank. At the rear is a single 245mm disc, with a calliper equipped as per the front with pads produced in a sintered material to increase efficiency. The standard equipment is completed with the Bosch 9.1 MP ABS system with internal pressure sensor. LCD INSTRUMENTS: The dash of the Monster 797 comprises a large, high-visibility LCD screen, featuring the main and secondary functions. The unit provides data including speed, engine revs, total mileage, trip1 and trip2, engine oil temperature, clock, average speed and journey time. LIGHTS AND INDICATORS: The front headlight has always been one of the distinctive traits of the Monster: with its modern, technological design, it boasts an LED position light and a single bulb for the high and low beam functions. 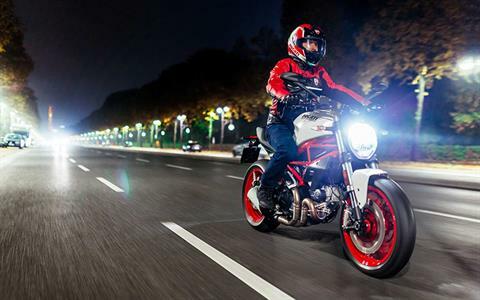 LED technology is also used for the compact rear light and licence plate light. 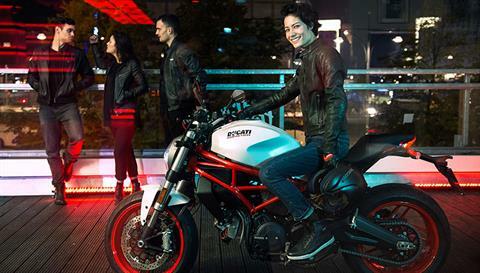 The bike is also equipped with hazard lights, activated by pressing the dedicated indicator button. USB AND DMS READY: A USB port is located under the seat of the Monster 797, useful for charging a smartphone or any other device with a USB connection. The Ducati Multimedia System is available on request and allows for latest-generation smartphones to be connected to the bike via Bluetooth technology, so that the rider can manage the music player and receive notification of any incoming calls or messages. 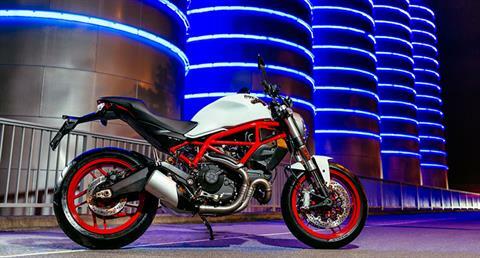 803cm³ DESMODUE: The Monster 797 is powered by the air-cooled 803cm³ Desmodue twin. Though inspired by the Monster’s roots, it is a modern, Euro 4 homologated engine, able to unleash 75 hp of maximum power at 8250 rpm. Characterised by 88mm bore and 66mm stroke, it has been designed to offer sheer enjoyment without ever proving difficult to ride. The 2 in 1 exhaust has been designed to guarantee optimum fluid dynamics and excellent heat protection for the rider and passenger. The engine of the Monster 797 is also competitive in terms of its maintenance intervals, with services required every 12,000 kilometers. GEARING AND CLUTCH: The Desmodue is equipped with a six-speed gearbox and APTC multidisc wet clutch with control cable, which guarantees a light clutch lever action and offers optimum modulation, a great help when it comes to managing continual start-stop action in city traffic. 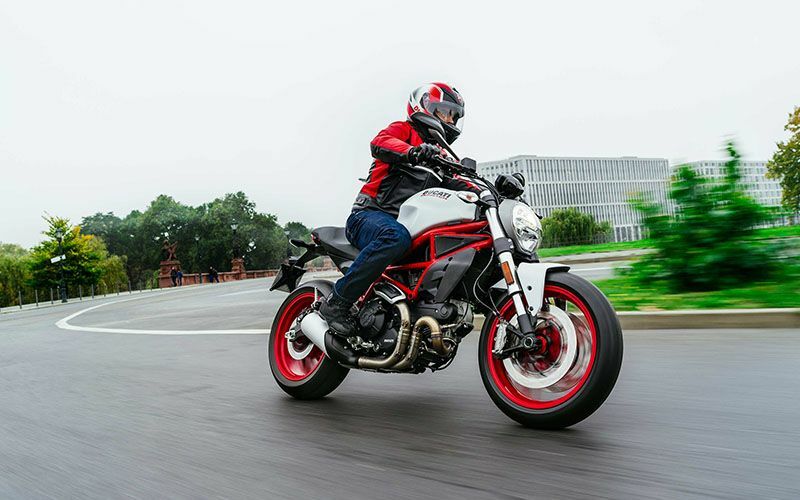 The clutch is also equipped with the anti-wheelie function, which keeps the bike stable even during aggressive shifting, typical of sports riding. 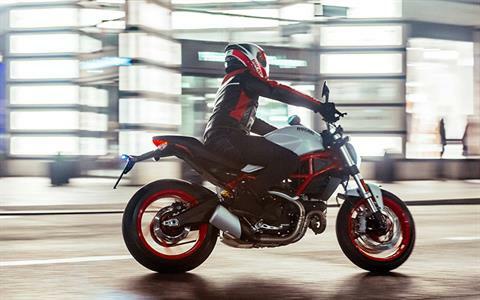 POWER AND TORQUE: The Desmodue engine of the Monster 797 unleashes 75 hp horsepower and maximum torque of 6.93 kgm at 5750 rpm. 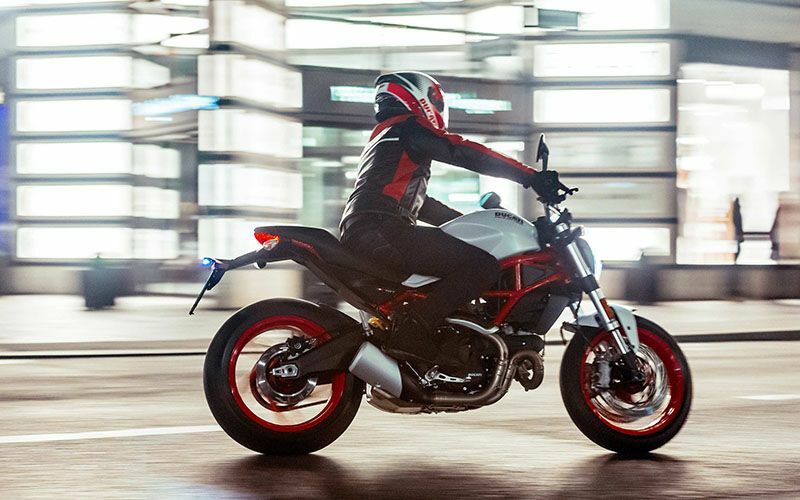 Thanks to the 50mm single throttle body with two sub-butterfly injectors, power delivery is fluid and full at any speed, a stand-out characteristic of all Ducati twins, and ensures a rapid response to any twist of the throttle. 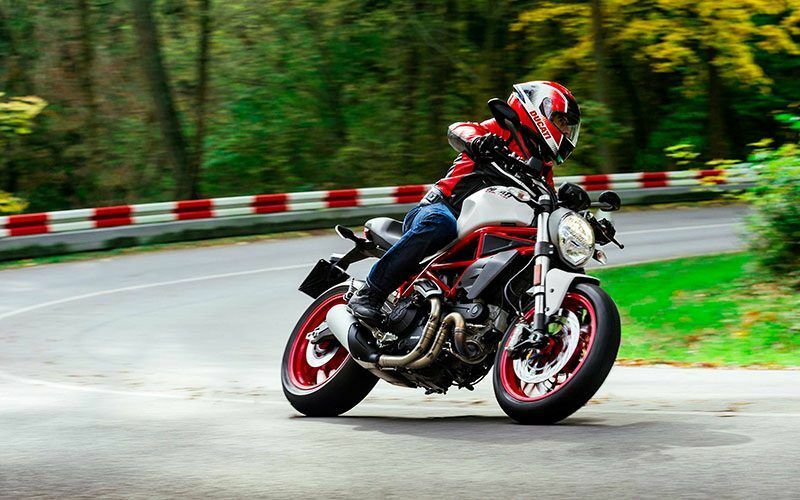 The constant torque curve, with 90% of maximum power available between 4000 and 8500 revs, ensures maximum riding enjoyment with minimal use of the clutch. The Monster 797 is the ideal bike for those seeking carefree enjoyment, whether in the city or out of town. The design recalls the iconic bike of the 90s, reinterpreted with a modern twist: the trellis frame, a traditional Ducati trait, perfectly marries with the muscular tank and rear double-sided swingarm in cast aluminium, lightweight and sporty, with side-mounted shock. 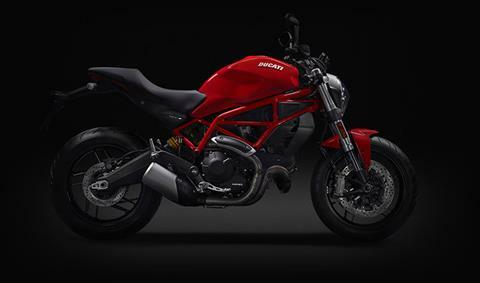 The seat, positioned just 805mm from the ground, the wide handlebar and wide steering angle ensure agility in traffic and stability at high speed, while the contained weight and chassis offer the rider great feeling, whatever the experience level. Front - 10-spoke light alloy, 3.5 x 17 in. Rear - 10-spoke light alloy, 5.50 x 17 in.